Man is born of feelings. While living in the world, he lives according to the feelings that arise in him. That which deeply affects the feelings become samskaras, the impressions in the mind. At the time of death, he carries this bundle of feelings as his life’s wages and goes to his next birth. In this way, he is trapped in the cycle of birth and death. The false attachments of ‘I and mine’ cause deep impressions in the mind. If these are removed, man will have the vision of the all-pervading Atma. He would see that God and the universe are One. The universe belongs to God. We wrongly separate it with ‘I and mine’. Instead, if we are constantly aware that all belongs to God, wisdom will be born in us. The false attachments of ‘I and mine’ cause deep impressions in the mind. If these are removed, man will have the vision of the all-pervading Atma. When the feeling that jeeva, Shiva and the universe are one grows and fills the consciousness, it becomes Universal Consciousness. I have come to demonstrate this principle of Oneness through the example of my life. The word feelings refers to ordinary human feelings. Omnifeelings mean divine feelings. I desired to attain God. I wanted to marry Him. After having secured a vision of the Divine, I talked, laughed and enjoyed many experiences given by the Lord. However, I was not satisfied. I cried wanting more and more from God. I pleaded for a thousand hands, a thousand eyes and a thousand mouths to worship Him. Still I was not satisfied. I prayed that the whole world become like me and catch hold of God alone. I lamented and cried more. This led to the Vasanthamaya Universe. Now the feelings of one Vasantha have become Vasanthamayam Universal Omnifeelings. It becomes the feelings of 580 crore Vasanthas. An individual creates his next birth through his feelings. Through Omnidivine feeling, I am creating a new universe. To translate this Omnidivine feeling into action, I have to make the sankalpa. How? Let us see now. An individual creates his next birth through his feelings. After I emptied myself, Swami filled His Truth in me. Now this Vasantha Truth is in the Being State, the state of witness. This Vasantha Sathya wills to create. Through will, it divides itself into two, Vasantha Sathya and Vasantha Prema. 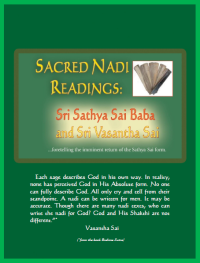 Vasantha Sathya becomes the Indweller, Vasantha Prema, the Shakthi, and enters every aspect of creation. The Indweller and the Shakthi enter everything and everyone. This is how New Creation begins. The basis of New Creation is Radha Krishna’s love. Vasantha Sathya is the Being State. Vasantha Prema is the Becoming State. Everyone’s nature is only Prema. This inherent nature becomes the power or Shakthi in all. Sathya becomes the Indweller. Now the qualities that are inherent in me i.e. the yearning for the Lord, the desire to offer myself totally to God, the ‘I without i’, will function in all. The scriptures are called Mother. This mother will not neglect her children. Her only concern is that they should be protected and nurtured; showering her compassion continuously, she reminds them of the goal. What is the goal? It is to be awakened to the inexpressible, immeasurable and incomprehensible, Brahman. This is ‘Sastra yonithwaath’. What is the goal? It is to be awakened to the inexpressible, immeasurable and incomprehensible, Brahman. The Vedas that create awakening in man has taken form as their first sound, Agni and come as this ‘Veda Mother’, so that all will be redeemed and protected. This is why Swami has brought me. Therefore, the wisdom of the scriptures goes to everyone through me. This is Agni creation. My children will be like me; they receive knowledge from me naturally without studying the scriptures. If the Vedas were to become the Mother, how would the children be? Lord Krishna refers to this in the Bhagavad Gita and says, “I place the seed of creation in the womb of Prakrithi.” When Prakrithi becomes the Mother and bears the seed of God, all is God. Therefore, the wisdom of the Vedas becomes inborn in all the Mother’s children.